'Quality means doing it right when no one is looking' As one of the few remaining workshops, still employing traditional gilding techniques, each piece has to undergo a painstaking preparatory process to build up an ultra smooth surface known as the ‘substrate’ before any leaf can be laid. As the above quote implies and experience has taught me it’s essential you get this substrate right as it dictates the quality of the final finish. The first stage of building up the substrate is to make a batch of rabbit skin glue. A small amount of the batch is used as a wash which is applied to the wood that makes up the artefact. The remainder of the rabbit skin glue is used to make the gesso and the ‘boll’ that is used to seal the gesso. Once the wash is dry the surface is coated with up to four layers of a super-fine plaster called gesso. Gesso is used to even out the grain and any imperfections in the wood. 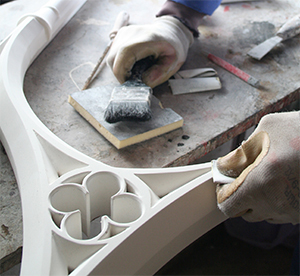 It is applied using a brush with each coat being applied before the previous coat has dried out so that they bond together to form a single, even layer of gesso approximately 1-2mm thick. 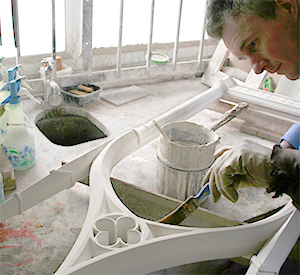 Once dry, the gesso is sanded back to produce a flawlessly smooth surface. If any raised pattination is required this is achieved by applying a material called ‘combo’. The area must be traced out, the combo’ applied and shaped by hand then smoothed. For a large script mirror this combo’ work may take half a day to apply. As with most traditional techniques, gesso has been replaced with high build paint substitutes. I have avoided using these as gesso gives a softer, more rounded, aged character to the finished piece.